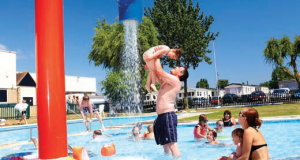 A new £1 million pool complex is being built at Seawick Holiday Park in Clacton. One of Clacton’s largest holiday parks, Seawick in St Osyth, is investing £1m this winter on a prestigious new swimming pool complex. It’s envisaged that the new pool complex, complete with flumes and new changing areas, will be ready for the park’s re-opening in March. Owners of the park, Park Holidays UK, says the pool will benefit not just the local economy but also the environment – as it will be heated by a super-efficient biomass boiler. Much more environmentally friendly than conventional heating systems, the green energy boiler will be fuelled by wood pellets and reduce substantially the park’s carbon emissions. Seawick’s new pool will complete a series of new developments at the park, which included the opening of a new £1.8m entertainment complex last summer.